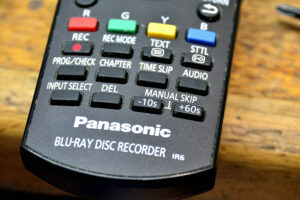 Some of the buttons on the Panasonic DMR-BWT720’s remote control have stopped working, or have become unreliable. 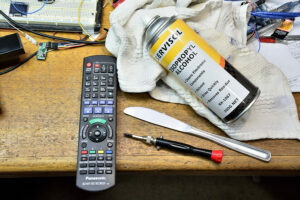 I suspect eating dinner in front of the TV (and therefore using the recorder’s remote) with greasy hands etc, has meant grease and liquids has infiltrated the remote over time. 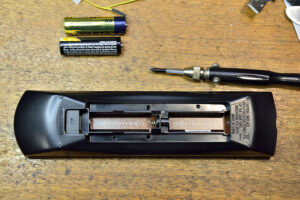 First thing to do, is remove the two AA cells, and remove the two small Philips head screws. Next, peel apart the two case shells. I used a regular (rounded-end) kitchen knife. Screwdrivers tended to make a mess, so a thin and broad surface works better. Once you get started, probably mid way along the length, it becomes easier to separate, especially when both ends have lifted. Be careful, and don’t be too aggressive. With the two halves separated, I’ll be using IPA (Isopropyl Alcohol) spray on a rag to wipe clean the PCB tracks, and the back of the rubber press button contacts. 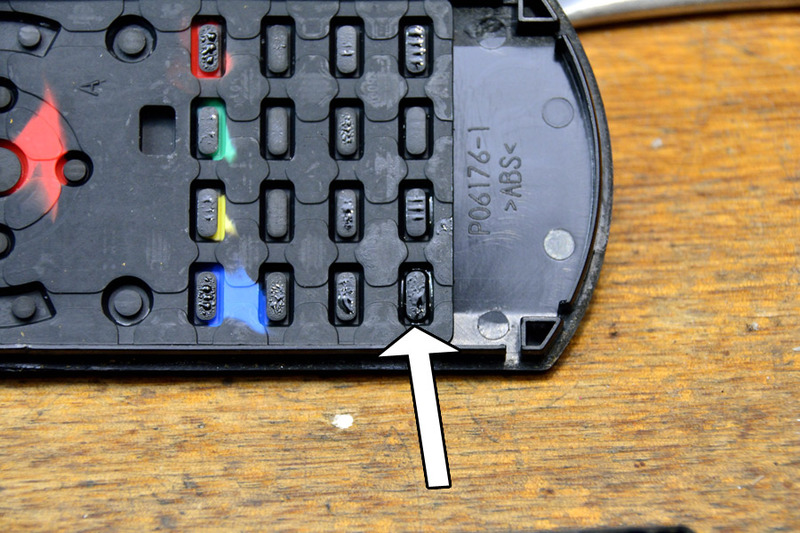 It became obvious why some of the rubber keypad buttons were not working. 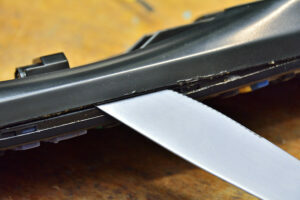 Some gunk can be seen on the rear of the switch contacts. Wiping clean the PCB contacts, and the rubberised switch contacts. Some of what gets wiped off the contacts is easily seen. Once all the contacts have been cleaned, and ensuring that the rubber keypad buttons are all protruding through the front shell properly, snap the case back together. Put the screws back in, and install the two cells. All you need to accomplish this, is 10 minutes, a kitchen knife, a small Philips head screwdriver, some IPA and a rag. Easy… should have done this ages ago!